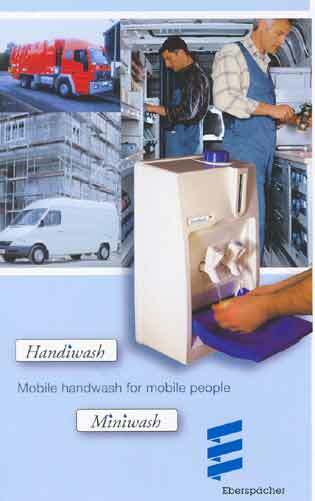 Handiwash is suited for mobile tradesmen, professional field workers, maintenance workers and food vendors. It also has applications in utility vehicles, and with leisure interests such as off road enthusiasts, campers and anglers. An automotive handwash system, where hot and cold water at any location is now an affordable reality. Without question, it is the most compact, easy to install and technologically advanced mobile handwash unit. For anyone whose work brings then into contact with hazardous substances, or unhygienic conditions, it should be considered a necessity. Extensively used by major companies, this handwash units can assist you in meeting occupational health and safety requirements. The HANDIWASH is type approved and CE approved. It conforms to ELV directives.